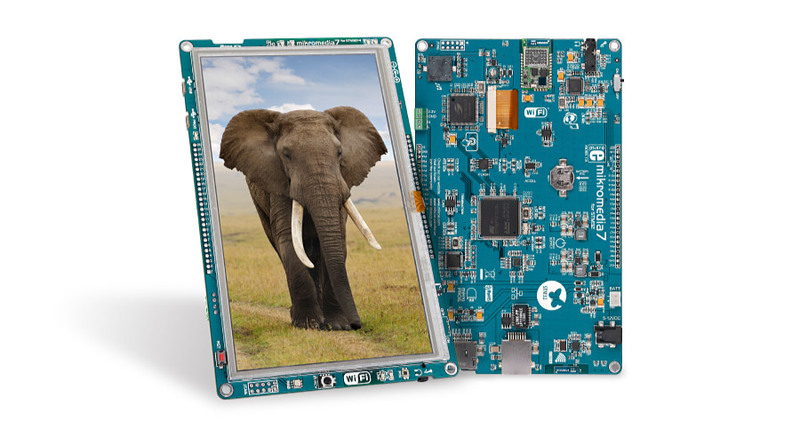 Amazing 7" 800x480px touch screen and over 30 on-board modules, including Ethernet, WiFi and ICDI debugger all packed onto a single board. Everything is orchestrated by the mighty STM32F407ZG ARM Cortex-M4 microcontroller family. Start building your applications with intuitive, user-friendly menus and dashboards using powerful STM32 ARM Cortex-M4 microcontroller. This board provides a compact high-quality multimedia development platform for STM32F407ZG device. The reliable and powerful STM32F407ZG has 168 MHz operation (210 DMIPS), 1 MB of Flash, 192 + 4 KB of SRAM, 140 I/O pins and more. Mikromedia 7 for STM32F4F4 is fully supported by mikroC, mikroBasic and mikroPascal compilers for ARM. Compilers come with dozens of examples that demonstrate every feature of the board. Easily create fantastic colourful graphical user interfaces (GUI) for mikromedia in Visual TFT software. Even total beginners will be able to create amazing applications.